Power, grace, and personality: draft horses have it all. 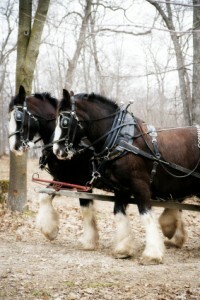 Originally bred to do all of mankind’s heavy work, draft horses now are the companion of choice for many horse lovers. Make no mistake: there are still plenty of big Belgians pulling hay wagons and Percherons dragging trees out of woodlots – not to mention some Clydesdales and their beer wagon! Maybe you’re one of the many people who have a special place in your heart (and barn!) for draft horses. If that’s so, you’ll want to find gold draft horse jewelry for your horse jewelry collection. This can be a little challenging. Artists and jewelry designers have designed lots of pieces of horse jewelry with fine-boned Arabs and speedy Thoroughbreds. Gold jewelry with draft horses is harder to find. 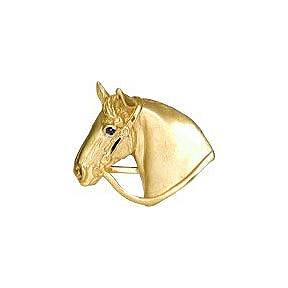 That’s why we love this 9K gold shire horse pin. It’s from England, a country where they love their draft horses. The satin finish mimics the super-soft side of a draft’s neck – the best place to nuzzle up on a frosty morning! The bridle and reins are worked in a shinier gold, and the eyes are sapphire. This brooch exemplifies the draft horse’s beauty, power, and grace. There’s something in the horse’s expression that gives you a clue about his personality, too: that draft horse curiosity, that steady good nature, that determination to get every bite of the carrot hidden in your barn jacket pocket. You can wear this brooch anywhere. Its classic lines and elegant style would be at home in any office. The brooch looks lovely on a blazer or sweater; pair it with a casual jacket when you’re out and about. Draft horse jewelry can make a great gift. We’ve found that a lot of the best draft horse jewelry comes out of England and Ireland. Check antique horse jewelry auctions and with horse jewelers who sell estate horse jewelry. You never know what treasures you might find!